Hydrangeas For Fall Color | Faddegon's Nursery, Inc.
We all love the big colorful and showy blooms of hydrangeas in the summer. The variety of shapes, colors and sizes is one reason they are so popular. Is there anyone who can’t find a hydrangea to love? There is at least one to fit everyone’s space and taste. There’s another reason to love hydrangeas, and that’s the incredible fall display many of them offer. The paniculatas can be a stunning addition to the fall garden, with their big cone-shaped flowers gradually changing through the season until fall gives them their most intense color. A few varieties come to mind when considering hydrangeas for fall.’Bloomstuck’ is a fabulous compact specimen. Yes, it’s a mophead, but that doesn’t mean it lacks for fall flare! The blooms age to gorgeous hues of rose and plum, but the show doesn’t stop there. The foliage then turns a deep burgundy color.’Limelight’ & ‘Little Lime’ are well-known for their cool chartreuse blooms in the summer that seem to light up the garden. The flowers age, developing pink splotches. 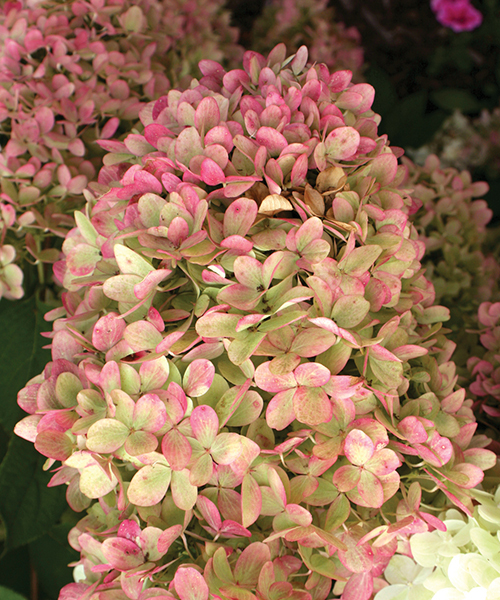 The effect is bi-color panicles of lighthearted pink and green beauty.’Pinky Winky’ is a classic favorite of the hydrangea world. Strong red stems hold its pink and white panicles aloft from midsummer to frost. The pink deepens to a rose pink that’s out of this world! The blooms are huge and never disappoint.’Quick Fire’ distinquishes itself by blooming up to month earlier than other panicle hydrangeas, coming alive with loads of pure white flowers. As you enjoy your landscape through the season, watch as ‘Quick Fire’ turns rosy salmon ever deepening toward fall. The foliage ages in fall to a lovely soft orange.’Vanilla Strawberry’ & ‘Strawberry Sundae’ have become huge favorites of the hydrangea lover and it’s easy to see why! Creamy white blooms start in midsummer turning a true blush pink. As the season progresses, the flowers deepen their pink finally turning red in the fall.